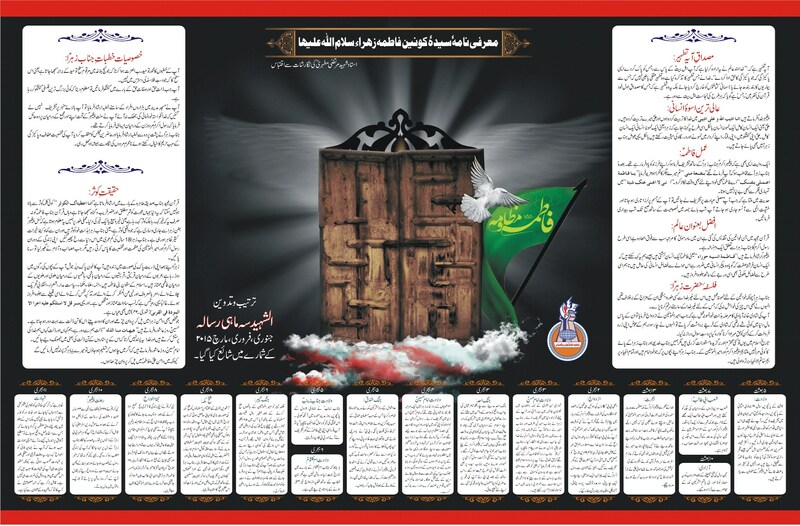 Shahadat Anniversary of Bibi Fatima [Salamullaah Alaiha] Marking the Ayyam-e-Fatimiyyeh [AS] Mournings. 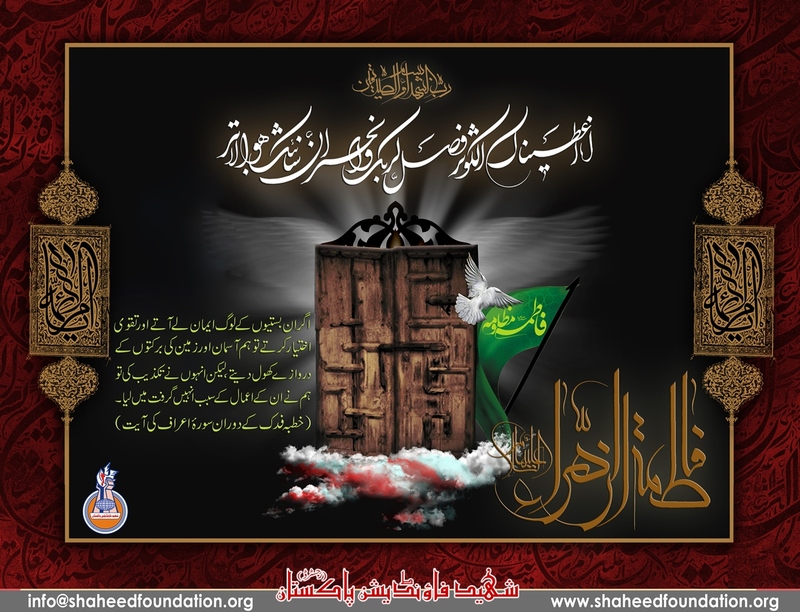 On this gloomiest day of the shahadat of Bibi Fatima (sa), Shaheed Foundation Pakistan`s entire team presents its condolences to Imam-e-Zamana (atfj) and prays that our last Imam comes as soon as possible to take revenge from everyone who caused sadness to Bibi Fatima (sa) and rebuild Janatul-Baqi, ameen. 2. I testify that there is no Diety (Lord) except the sole and matchless Allah. And the testification of the singleness of Allah is a word that Allah has declared sincerity (as) it's reality, and made the hearts the centre of it's contact and union. And has made the specifications and research of the oneness of Allah's station obvious and evident in the light of meditation. The Allah Who can not be seen by the eyes and tongues are unable and baffled to describe His virtues and attributes. And the intelligence and apprehension of man is helpless and destitude from the imagination of his howness. 17. And (Allah set) the subordination and obedience of us (the houshold of the Prophet (SAW)) for the security of society's system and our Immamate as a safety from seggregation and disunity). 38. Underlying are the rhymes which Hazrat Zahra(s.a.) recited upon the mourning of Prophet's (pbuh&hf) demise.